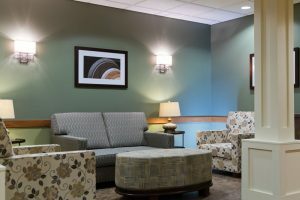 Meadowbrook Healthcare, the North Country’s Provider of Choice, is now offering a full continuum of skilled nursing care including Subacute Rehabilitation, Limited Assistance, Restorative Therapy and Skilled Nursing Services. Meadowbrook is a 287 bed facility in the heart of Plattsburgh, New York. Our campus is nestled within a quiet and secure residential neighborhood adjacent to the area’s premier hospital (CVPH). Meadowbrook Healthcare is an integral component in the area’s healthcare continuum. We are licensed by the New York Department of Human Services. Membership is also maintained in the American Health Care Association and New York State Health Facilities Association. For over 40 years Meadowbrook’s devoted, compassionate team members have been providing healthcare to our community. Meadowbrook takes pride in employing the most qualified personnel in the industry; including 4 Full-time, Board-Certified, Medical Physicians. Whether you or a loved one needs Subacute Rehabilitation, Limited Assistance, Restorative Therapy or Long-Term Skilled Nursing Care, our licensed personnel and trained staff are committed to providing care in an atmosphere that promotes healing and enrichment.